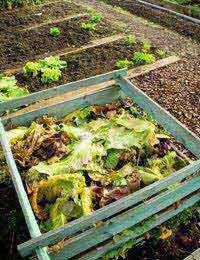 Composting is the wonder method for converting food into fertiliser. It is a science, and an art form. Composting takes all the elements of heat, light, dark, matter, liquid and bacteria, blends them all together in different quantities and different time periods, and produces new material - ideally a rich deep dark brown soil that crumbles through the fingers and loving enhances any living plant that cares to grow in it. For centuries, living plant matter, as well as animals and humans, have lived and died and broken down through exposure to heat and light and bacteria .The oil that humans voraciously guzzle into our cars and aeroplanes started life some millions of years ago as trees and plant matter - some millennia later oil is the raw product (in its rawest state) of this decomposition process. Composting, with human input and control, is a direct descendant of this same process. Who knows if left long enough, if our potato and Brussels sprout peelings were left in the compost bin at the side of the house, would turn into a gloupy liquid which could be refined into oil or petroleum! As well as scraps of food and peelings, it also possible to put cut up cardboard and paper into a compost bin, as well as grass clippings and other garden waste, such as most prunings and plant matter. An at home composting system is easy and even fun to set up. Many local Councils sell cheaply or even give away during promotions compost bins made from plastic, in varying sizes. it is also easy and straightforward to custom build a composter out of wood. Search the internet for printable instructions.If you choose to build it yourself you can design it to fit a specific area, and it could even have several compartments to accommodate different piles of compost at different stages of decomposition. Many shops and garden centres sell ceramic pots to keep in the kitchen as a storage container in which to take the kitchen food scraps to an outside compost bin. These can be very attractive decorated pots, but the expense and outlay is unnecessary - any container, or container with a lid can be used. Walking to an outside compost bin with containers of food scraps and peelings can be classed as good exercise! Contrary to popular opinion, if the person in charge of a compost bin knows what they are doing, most types of food scraps, including cooked food, can be added to a compost system. But if the householder is just starting out, and is new to the wonderful world of composting, then it is best to avoid cooked food of any kind. Don't forget however that any bread or crackers can be given to the birds - particularly as they need any extra food they can get during winter time. Most local Councils green bin home collection scheme accepts cooked food - check with the local council as to what can and cannot go into the green bin. As most Councils operate a fast composting system, which involves a machine with temperature control and internal raking - 'turning' the material regularly - this can break down the material, which can include cooked food, rapidly and easily.Putting cooked food into a composting system can also attract rats and other wildlife, which can easily get into home built bins, or the thin plastic compost bins which are sold commercially. Both paper and cardboard can, and should be added to compost piles, in moderation. Both materials should be cut up or ripped up, and ideally should be soaked in water for a few days. This breaks down the fibres and makes them more exposed to the elements, such as heat and light, as well as worms, woodlice and bacteria, that actually do the hard work of breaking the compostable materials down. Once an individual or a family gets involved in composting, and actually sees what becomes of the food that was once in their kitchen, then the process becomes a highlight of life. Composting takes little work, as the process quietly gets on, while we humans are getting on with our lives. It can be a great joy to discover exactly what types of materials, scraps and other waste can be composted, and it reduces our personal output of waste too! What's in the Average Home's Waste?